I recently had a brand new licensee contact me and they mentioned how important it was for them to pick a large national broker to associate with. I thought this was interesting, because from experience I suspected this was not the case. I say from experience because I started my real estate career working under an attorney who was also a licensed real estate broker. Yes we were a two person local office. I successfully closed deals in my first year of business even though we were a very small independent office. Since that time we have both switched to a much larger real estate brokerage company and it truly has been for the better. 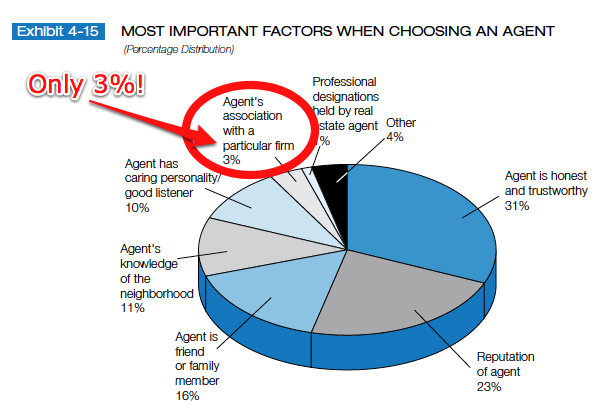 It is interesting to see as illustrated in the graph within the post above, only 3% of consumers felt that the name of the real estate broker that an agent worked for was an important factor in selecting a real estate agent. That is a pretty small number. However, as I suspected the factors that do matter most are the reputation of the real estate agent, how honest and trustworthy the agent is, their knowledge of the local area and market, and their communication and listening skills. Agents that are recommended by a consumer’s close friend or relative also have an advantage. So in light of this information, I suggest that you keep an open mind when looking for a real estate broker to associate with in your local area. Don’t discount any company as a potential real estate broker to associate with just because you don’t recognize their name. They might have a sweet deal for you as an agent with high commission splits and low fees with all of the agent tools that you could possibly need. « What are real estate commission splits?